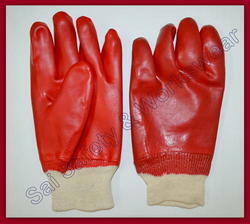 PVC SafetyHand Gloves is known by its customers as the no.1 global private-label safety glove manufacturer in the world. 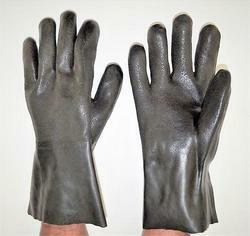 For over 30 years, hundreds of globally renowned PPE safety brands have been relying on Midas Safety as a credible OEM of industrial safety gloves. Our vast range of products makes us the only super market of gloves, committed to offering consistent quality and innovative solutions to our customersacross 50 countries. Our customers know that their business can progress and thrive safely when they work with us. This is demonstrated every day through exceptional customer service, high quality product manufacturing and industry knowledge. From a single manufacturing unit in its early days, Midas Safety has, over time, vertically integrated to 15 facilities across 10 countries, covering all stages of the product development cycle; from procurement of raw materials, and spinning and plying our own yarn, till the manufacturing of the end product. Midas Associates have factories located throughout Asia, in Pakistan, Sri Lanka and Bangladesh. All manufacturing units have installed 9001 Quality Assurance Systems, which are regularly audited by independent external auditors. 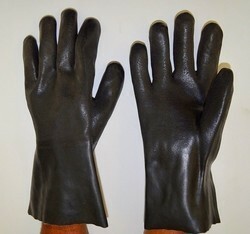 Textured finish on palm and fingers provides added gripping ability in wet applications. 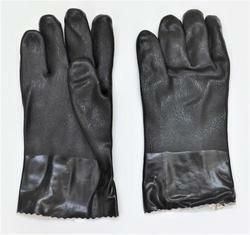 Heavy duty gloves are ideal for tough environmentsavailable in a variety of lengths. 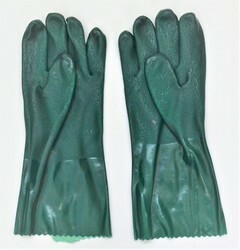 PVC Unsupported Gloves plain /Checkered in sizes from 12" to 18". Acid and Alkali Proof. 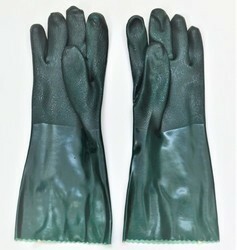 Useful for a chemical factory, water lining recommended where dexterity or sense of work, light in weight for better grip. 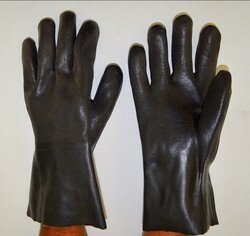 PVC coating essentially gives the gloves a protective layer. This has profound application in handling chemmicals such as cyclohexame, formic acid and hydrocloric acid. 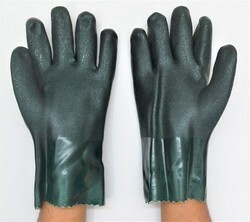 PVC coating essentially gives the gloves a protective layer. 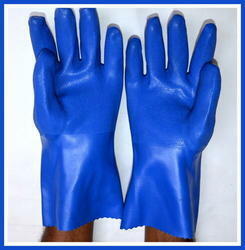 This has profound application in handling chemicals such as cyclohexame, formic acid and hydrocloric acid.